Packaging Standards | Goldrich Printpak Inc.
Goldrich is now a GFSI “FSSC 22000 V3” certified manufacturer. Our certification gives us both global and domestic recognition as well as makes a statement that Goldrich Printpak Inc. is committed to providing ongoing food safety. Thus gaining both manufacturing and consumers confidence in its strategic initiative. FSSC 22000 stands for food safety system certification. It is a global system that sets out the standards and requirements for a globally effective Food Safety Management System. This certification allows us to provide traceability within the food chain both nationally and globally to further ensure that the supply chain is totally secure. In 2017, Goldrich received ISO 14001:2015 certifications. This internationally accepted standard specifies the requirements for an environmental management system. 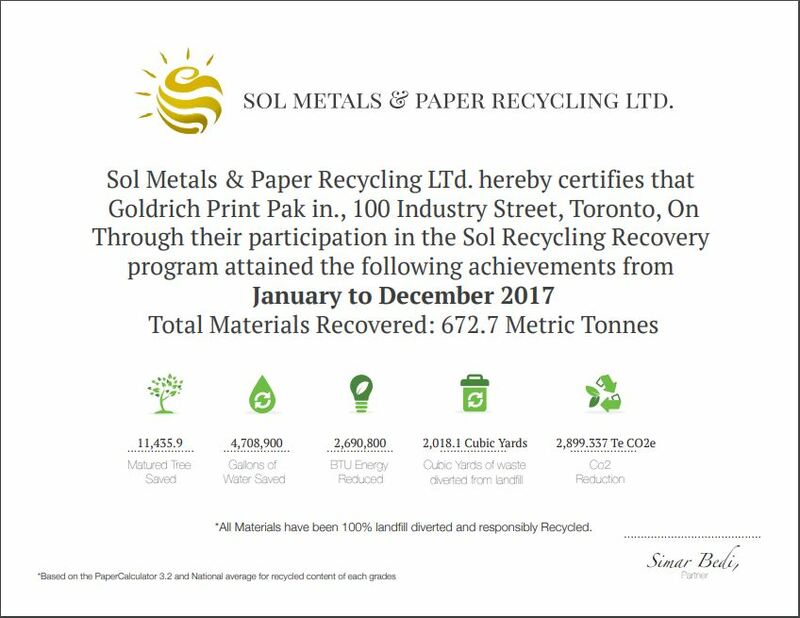 Obtaining this certification demonstrates our ongoing efforts to effectively measure, manage and continuously improve our environmental performance. Goldrich is an ISO 9001:2015 certified company, an acknowledgement of our commitment to quality management practices. The standard provides a framework for taking a systematic approach to managing processes so that the company consistently turns out product that satisfies customers’ expectations. It includes a requirement for continual improvement of our Quality Management System. We’re proud to offer products that carry the FSC Certified stamp of approval. It’s our assurance to customers that these products originate from responsibly managed forests and meet strict environmental criteria at each stage of the production chain. For every tree used for FSC certified products, nearly two new trees are planted. This certification is an important step in our efforts to become a greener company – and part of a meaningful cultural shift towards greater sustainability.